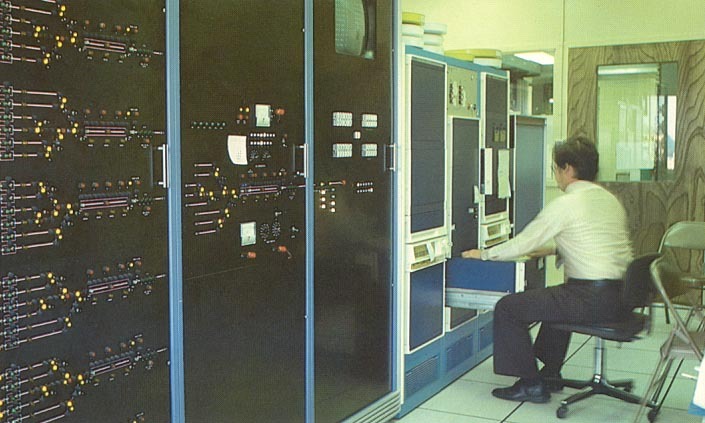 HEAD QUARTER OFFICES: The BLET National Division is located at: Standard Building, 1370 Ontario St., Mezzanine, Cleveland, OH 44113-1702 (built and owned by the BLET). The National Legislative Office is located in IBT Headquarters in Washington D.C.
For more information, contact the BLET Public Relations Department at the International Office by calling (216) 241-2630, ext. 248, from 8:30 a.m.-4:30 p.m., E.T. What is known today as the Danville District of Norfolk Southern, is a storied mainline with a rich past and bright future. The Danville District runs from North to South from Linwood, NC to Lynchburg, VA, and extends East from a line between those points toward Raleigh, NC. 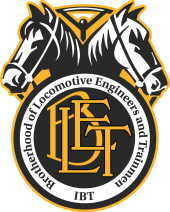 The Danville District is a part of Norfolk Southern’s Piedmont Division, and this area was formerly a part of the Eastern Division of the Southern Railway & Norfolk Southern, before the two divisions were combined around 1990. The North South mainline from Linwood, NC to Greensboro and the H-Line to Goldsboro, NC & beyond is a part of the North Carolina Railroad (NCRR), which was formed prior to 1850 by a private group of investors to construct a rail line between Charlotte, NC & Morehead City, NC. The cost of the original 223 miles of mainline was $3.4 million. Today, Norfolk Southern leases the mainline from the NCRR and maintains & improves the infrastructure as a condition of the lease. 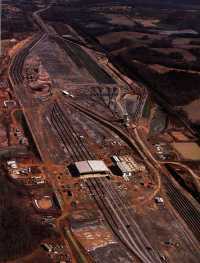 Spencer Yard at Linwood, NC was constructed between October 1976 and the fall of 1979, built to relieve congested flat switching yards on the Eastern part of the Southern Railway System. It would also replace the aging “Old Yard” & “Spencer Shops” at Spencer, NC. 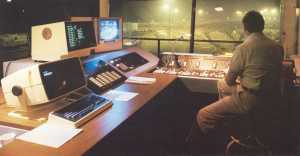 Built as a “state of the art facility” at a cost of $48 million over 25 years ago, it is one of the last major classification yards in America to be built from the ground up. It is named Spencer Yard in honor of the first president of the Southern Railway, Samuel L. Spencer. 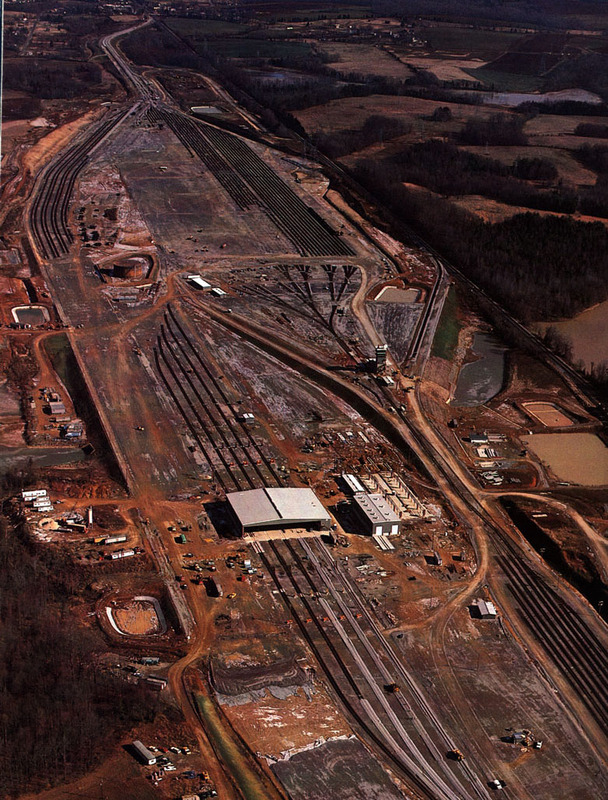 During construction, 5.6 million cubic yards of earth were moved, 6.5 miles of underground pipe were installed for drainage, 370,000 tons of crushed stone was spread to a 6 inch depth, & 225,000 tons of ballast was used under 65 miles of welded rail, culminating in the facility we have today. 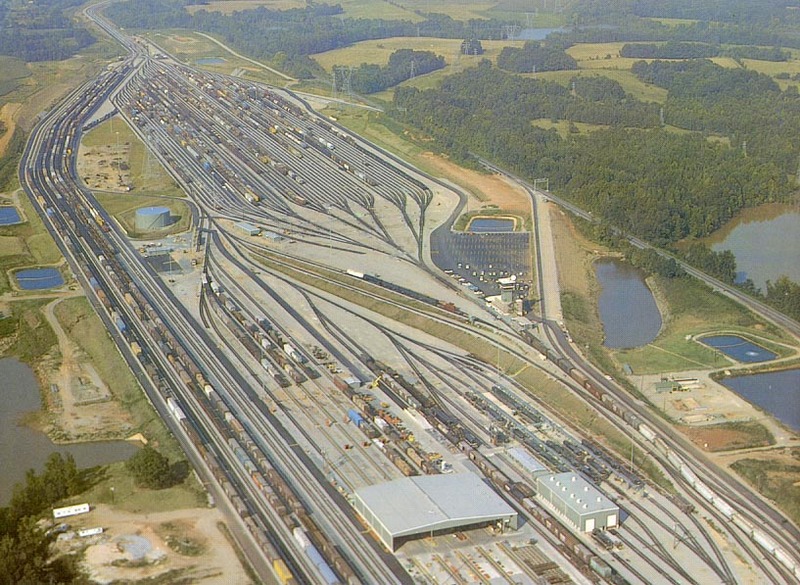 Spencer Yard typically processes over 1,200 cars per day & sees an average of over 30 trains per day, including “run throughs.” The yard is 4 and one -half miles long and occupies a 275 acre area in Southern Davidson county North Carolina. Yet another noteworthy part of this district’s heritage was the operation of “The Crescent” passenger train by the Southern Railway. Southern had many trains that operated over this district over the years, and more than 50 passenger trains per day used to make stops at Salisbury, NC. 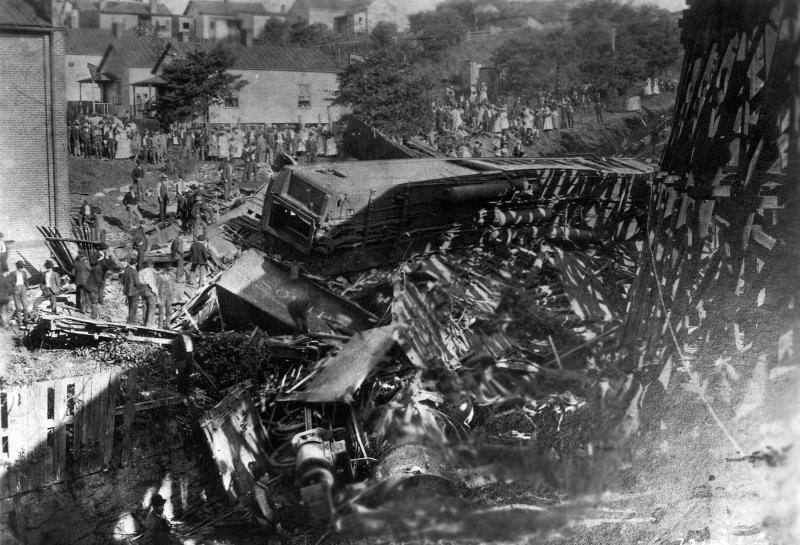 However, the Crescent was the premier passenger train of the entire Southern Railway System, offering service between New York City, NY to New Orleans, LA. It offered the very best in accommodations & hospitality available. In fact, so proud of The Crescent & the level of service which it offered, the Southern kept operating it, even though they lost money, several years after Amtrak took over operation of all the nation’s passenger service. Today’s Amtrak Crescents, numbers 19 & 20, still carry the name of the train, which began service over 100 years ago. 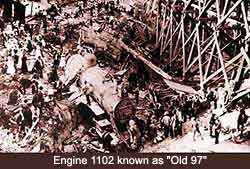 "Old 97," which consisted of four cars and locomotive No.1102, crashed on September 27, 1903. 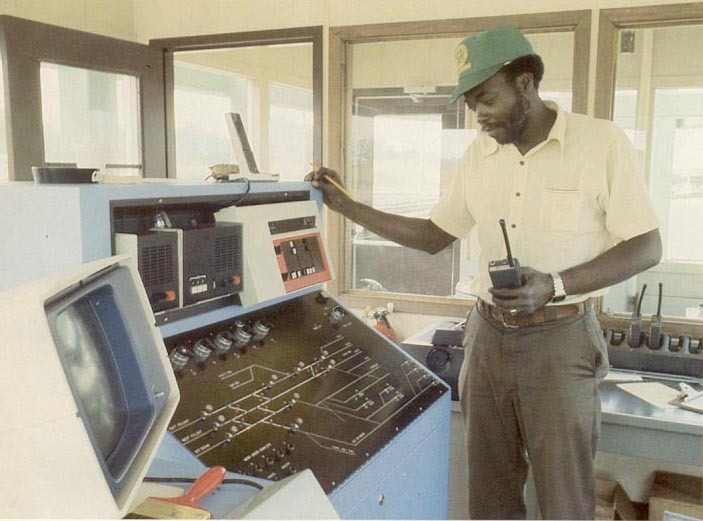 Running behind schedule, Engineer Joseph A. Broady was trying to make up time as his train approached Danville down White Oak Mountain. 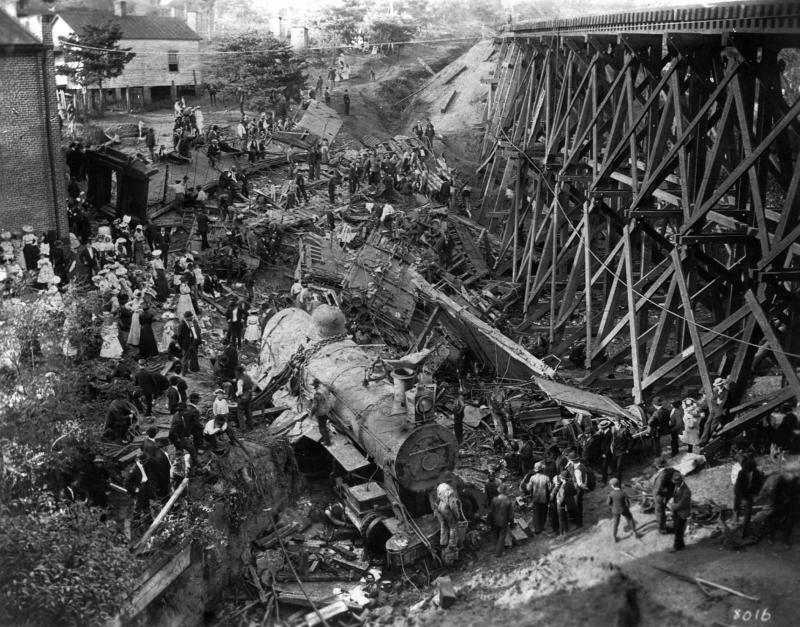 He realized he did not have enough air pressure to slow the train for an upcoming curved trestle, and in vain he reversed the engine to lock the wheels. 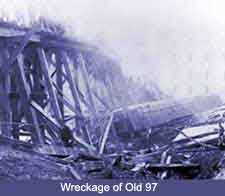 "Old 97" vaulted off the trestle, and 11 people were killed. 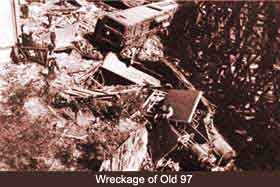 "The Wreck of the Old 97" was initially recorded commercially by Virginia musicians G. B. Grayson and Henry Whitter. More recently, the song was recorded by Lester Raymond Flatt & Johnny Cash.